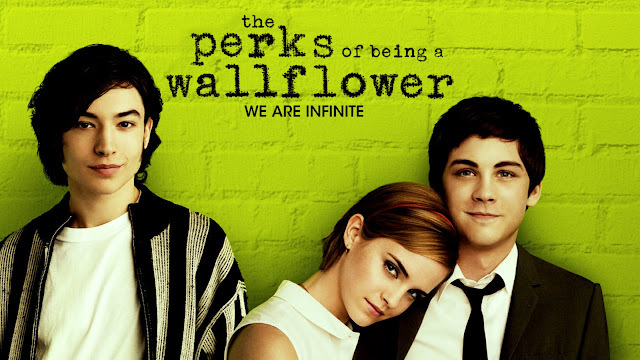 Today I'm going to be blogging about the Perks of Being A Wallflower! This is a book (and as you can see from the image above) a film too! The film stars Emma Watson (The Harry Potter series) and Logan Lerman (Percy Jackson series)! Charlie is a 15 year old-boy that is coping with high school. Now lots of you probably are now thinking, oh no, just another high school novel blah blah blah! NO! STOP! DON'T THINK THAT! This is a brilliant book that is absolutely certain to make you cry, laugh and enjoy being young! The film is (in my opinion) as equal, and possibly even better, than the book. Moving and perfectly honest everything about this film is ideal. The casting is un-real, Logan Lerman couldn't be a better Charlie and Emma Watson portrays Sam perfectly! Charlie isn't your usual boy, he has a slight difficulty. He's also been through a lot and in the film this is portrayed wonderfully with several flashbacks and memories! 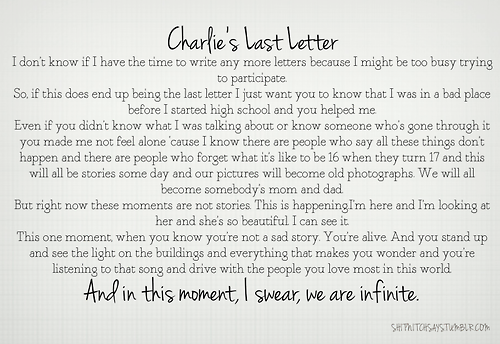 The book is written in letters, Charlie is writing to a Friend, and that is literally all we know, he starts his letters Dear Friend and as a reader we know nothing more than that! Charlie has close relationships with many people, his family, his friends and even his teacher! He is quite, he works hard, he tries to make friends. But not in a sad, clingy way, in a different way you wouldn't expect! 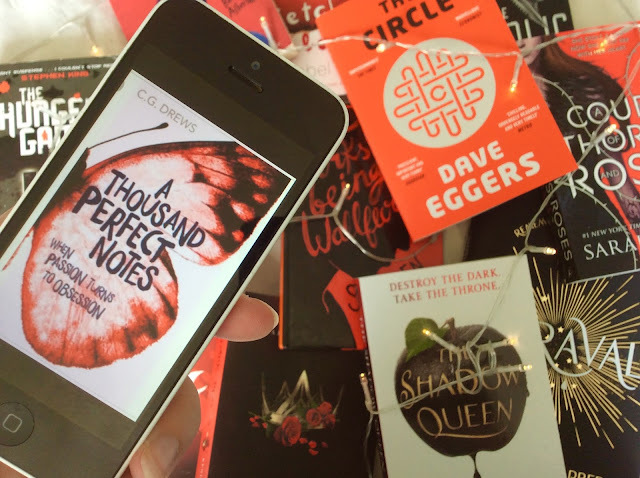 The book isn't a million pages long, its not a quick read either, its perfectly in-between! The script for the film was written by the author of the book, I love this, this means that the script was going to do justice to the book and all the right information was to be included! I honestly cannot praise this film/book enough! Please, please go read this, go watch the film, join the fandom, get involved! I got involved by a recommendation and you should do the same! This is also a brilliant books for girls and boys to read, as previously mentioned, Charlie isn't your ordinary boy so (without any bad intentions), boys in some way can relate to him and girls can love Charlie like I do, not because he's buff or sporty because he just is Charlie! If you're not into reading watch the film and you'll love the characters even more! Click this to go to an amazing summary by Schmoop!